Alex Clarke at Denison Yacht Sales sends in news that he's offering a 54m Mondo Marine M54 new construction project for sale. This is a steel hull & aluminium superstructure 800 GRT full displacement yacht that can be completed in 16 months. The hull, superstructure, and engine room are already completed. The project is waiting for a buyer to commit before moving forward with the build phase. Key features include six guest cabins including a full beam on-deck master suite, large tender garage aft, an expansive sundeck similar in size to those normally found on 60m+ yachts and a unique lounge area & pool located towards the bow. 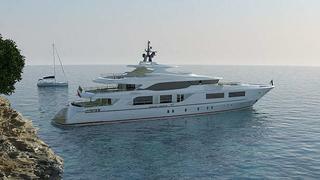 The project is currently located at Mondo Marine Shipyard in Savona, Italy and is asking €28 million.